In my basement wiring diagram - in Box #1 -- I have a 14-2 cable from the panel and a 14-3 cable terminating a 3 way switch (6 & 7) from the same circuit. Is this ok, normal, against code, dangerous? 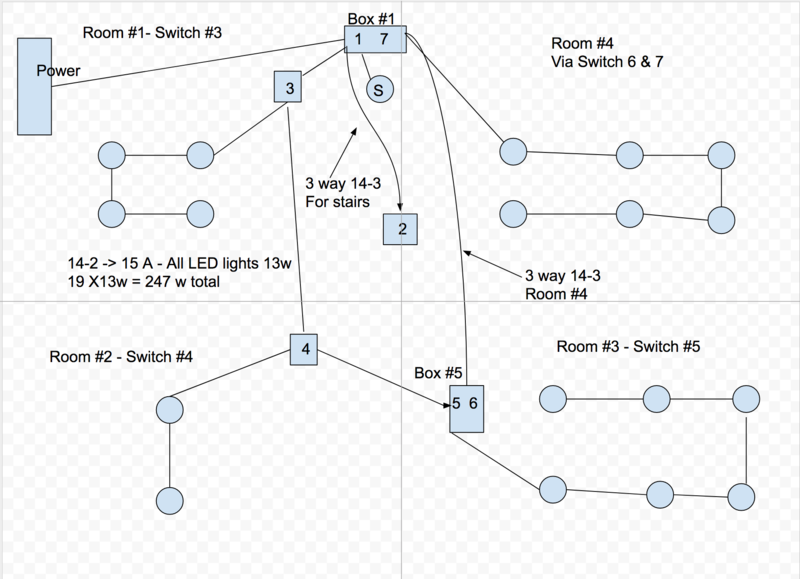 Is there a better way to wire my basement layout off of one circuit with two 3 way switches? No. You've created a wiring loop. There's a fundamental rule that currents must be equal in each cable or conduit. The way you accomplish that is by laying your cables in a tree topology. Any number of branches, but branches can't ever rejoin each other. You need to air-gap either the two things in box 5, or air-gap the two switches in box 1. Stick a partition inside the box and no wires cross it. Partitions are mandatory for separating low-voltage wiring from mains wiring in the same junction box. Truth be told they're not physically mandatory in this case, but the idea of total separation is mandatory. In fact, I really do recommend physical separation because if you don't, it's a matter of time before some gooberhead decides he wants to put a smart switch in a 3-way remote location, so he crosses the partition to poach a neutral wire. And now you have an illegal loop. Also remember you can take power to the lamps first and double-back to the switches in a "switch loop", but if you do, Code requires you to use 14/3 in the switch loop. That will leave a spare wire, which is future neutral for use by smart switches. Not the answer you're looking for? Browse other questions tagged electrical wiring switch multiway-switch or ask your own question.